Activation is needed for Purchased edition. 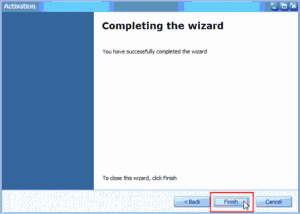 After complete the installation of eStockCard, you can proceed with the software activation. 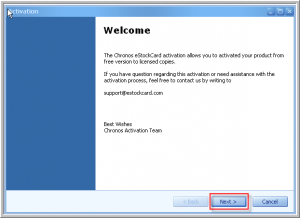 Login to Chronos eStockCard v3 and go to Information > Software Activate (only Client PC requires activation and Server PC no need to activate). 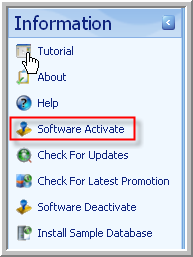 Click the Activate button to continue. In this screen, you can see the Serial Number field that needs to be filled up and the Identification ID is auto generated by our system. 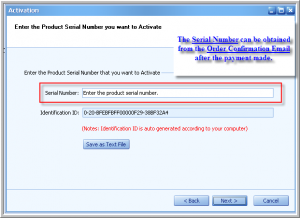 Please enter the Serial Number and it can be obtained from the Order Confirmation Email that we sent to you after payment. Then click Next to proceed. 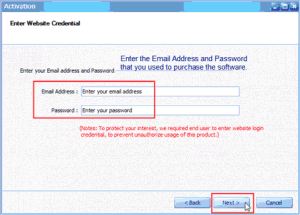 Enter the Email and Password that you used to purchase the software. If you can’t remember your Password, you can retrieve it at this page: http://www.estockcard.com/client_center_pwd_recover.asp. After you have filled up the required fields, click the Next button to continue. 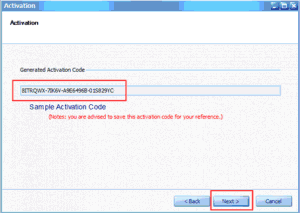 At this screen you can see the system generated an Activation Code for you. You can save the code for your own reference. Click Next to continue to the last screen. After activation complete, system will prompt this message. 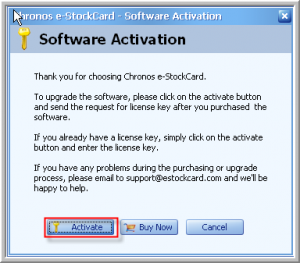 Click Finish to complete the activation process and you can start using your full version of Chronos eStockCard v3 inventory software.